At 115.5 x 59.8 x 11.5 mm the Galaxy W is still reasonably compact and pocket-friendly. The phone weighs a good 110 grams. Some might be tired already of the countless Galaxy S facelifts. We guess the Samsung Galaxy W I8150 is a distant relative too but the styling is different - in a good way. At 3.7-inches the screen is big but easy to manage and the textured rear makes it look solid - bordering on rough. The Galaxy W's 3.7” screen is an LCD unit (S-LCD according to some sources, but no word from Samsung yet). It won’t get you the deepest of blacks, but it’s a decent screen with nice viewing angles. The downside is the reflective and not particularly bright display is difficult to use outdoors on a bright sunny day. And the fingerprint prone surface doesn’t help either. Moving on, a video-call camera is right next to the earpiece above the display. There are also a couple of hidden sensors there: one for proximity and another one for ambient lighting. Underneath the screen, we find two capacitive keys surrounding the edged, metallic Home key . The haptic enabled Menu and Back keys have extra functionality upon a long-press (task switcher, virtual keyboard, voice search). There is a thin volume rocker on the left side, while the Power/Lock key is the only control on the right. At the top we find the 3.5mm audio jack and the microUSB port under a plastic flap. The Samsung Galaxy W’s rear features the 5 megapixel camera lens, complete with a LED flash and the small loudspeaker grill at the bottom. The lens and LED are placed within a strip of faux-metal, which is a nice accent. The rest of the surface is the finely textured battery cover, also made of plastic. The microSD card slot is under the battery cover, but it’s still hot-swappable. The SIM compartment is right next to it. There’s a 1500 mAh battery inside the Samsung Galaxy W I8150, but there is no official quote on the battery life yet. 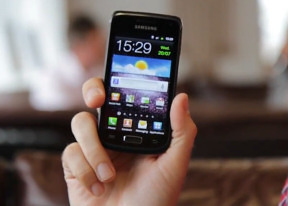 We bet the performance would be on par with the likes of the Samsung Galaxy Ace or the HTC Desire S.
Generally, we have no complaints about the all-plastic Samsung Galaxy W. It is a well-built phone, with a solid masculine look. It’s easy to handle and the differently patterned surfaces are nice accents on what’s an overall clean design.